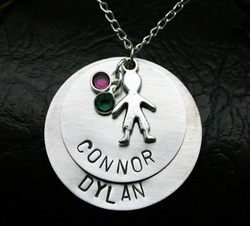 'Connor & Dylan' Necklace - 1.25' and 1' Solid Disc with Charm. Up to 2 Swarovski Crystals. Up to 24 characters (including spaces) on 1' disc - up to 15 characters on 1.25' disc can be stamped. Available in your choice of Sterling Silver or Aluminum. Comes with 18" Sterling Silver Box Chain.